Immigration is a hot topic in the United States right now, thanks in part to a rather blustery presidential candidate. But as this animated map created by Metrocosm reminds us, migrants have been a defining aspect of the U.S. for centuries. This interactive visualization was created by Max Galka, an entrepreneur and data wonk based in New York City. Using information culled from the Department of Homeland Security’s Office of Immigration Statistics, Galka’s colorful map shows who has immigrated to the United States since 1820, and where they came from. Each tiny dot that trickles across the ocean represents 10,000 individuals. As Galka points out, the map makes it look like immigration has been particularly intense over the past few decades, but the situation looks quite different when the data is viewed relative to the size of the U.S. population. Here’s the same chart as above, but with immigration shown as a percentage of the U.S. population. Of course, not everyone came willingly to the Americas. 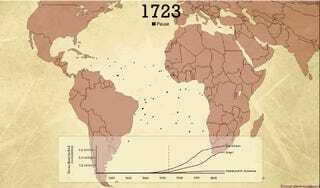 Last year, Slate created this animated timelapse of the Atlantic slave trade from the beginning of the 16th century to the 19th (short clip below). It condenses over 20,000 voyages down to just three minutes.